The clash between Iran and Israel heats up. Moreover, the Iranian government yesterday successful missile test in order to show the strength and defense of the Israeli attack. "With the fourth generation Fateh 110, the armed forces of our country capable of destroying targets at sea and the air, enemy bases, missile launchers, armory, radar and other targets," said Iranian Defense Minister Ahmad Vahidi. The new types of missiles capable of reaching distances up to 300 kilometers. With the range so far, Iran capable of striking neighboring countries such as Saudi Arabia and Bahrain and enemy ships in the Strait of Hormuz. The new missile is equipped with improvements to the navigation system, so the attack becomes more accurate. "With the new guide method, system installed in the destruction of the target missile. Evidently, the missile is capable of destroying targets without a miss," Vahidi said. United States and its allies accuse Iran of developing nuclear weapons facilities add uranium. 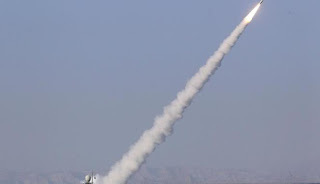 U.S. weapons experts say, Iran also designing missiles capable of carrying nuclear warheads.Last month, Iran has successfully tested a medium-range missile capable of reaching distances up to Israel in the exercise called "Great Prophet 7. "While the U.S. just struggling with sanctions and embargo, Israel has threatened to attack Iran. Prime Minister Benjamin Netanyahu said he would carry out the attack, with or without U.S. approval, if Iran is deemed to have extremely menacing.